I was hoping that the new update would resolve this. I've had this issue before but it got resolved a few updates ago, but now it's back. When I look at Google Street View all I get is a black screen. All the navigation controls are there, but no image. Any settings I need to change? Mark, do you have an example URL for testing? 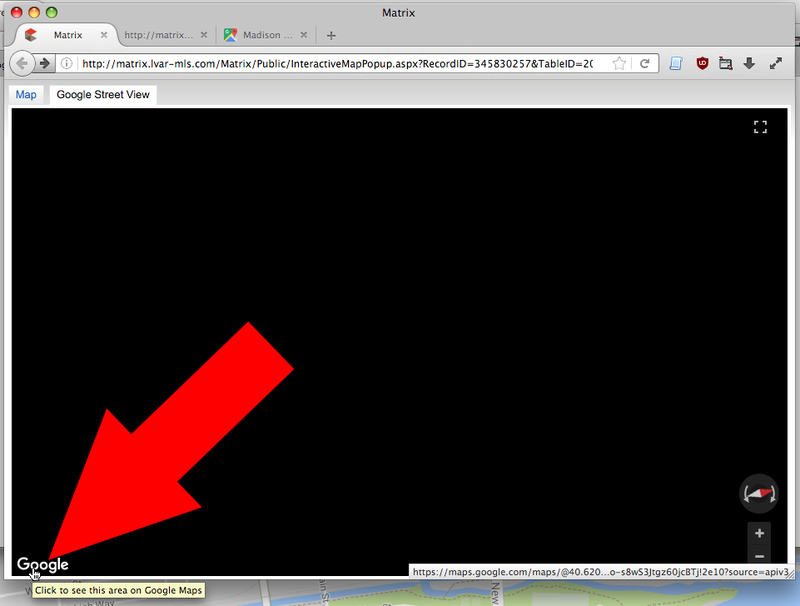 Once you open that page, click on the Map icon under the property address. It opens a second window where this problem occurs. I am able to see Street View when I open the Google Maps page, it only happens through my real estate portal, so maybe it's some kind of coding thing with how this particular website works? It's worked OK before. I tried turning off hardware acceleration in the preferences, I'd seen that in a forum as a possible fix, but then I got a white screen instead of black. Thanks for looking into this. Mark, I don't see such an option on that page. With regard to the regular Google Street View from Google Maps, I can view it on this G5. It's not very fast because we don't have hardware acceleration, but it definitely displays and you can (slowly) move around in it. Ihle Mark, your comment ended up in the spam sieve and your link is no longer valid. Doing a new search for property, however, I was able to reproduce your problem. As you noticed, what you're seeing is not the actual Google Street View but a service provided by http://matrix.lvar-mls.com/ that embeds Google data in a way TenFourFox doesn't like (neither does Safari 5.x with the latest Leopard Webkit). If you click the Google link bottom left in the black window you can view it on proper Google Street View. Thanks, I will give that a try once I'm at my home computer. I figured it was something like that, thanks for the tip! Confirmed your solution works, thanks!